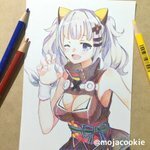 Kaguya Luna is a Virtual YouTuber who made her debut in December, 2017. As of fall 2018, she now operates under her own company, THE MOON STUDIO. In addition to her YouTube content, she produces music under the Sony Music label SACRA MUSIC. She is a loud, outgoing, fun loving girl with a somewhat selfish personality. Despite her deeply unprofessional nature, she quickly became the second most popular virtual YouTuber after Kizuna Ai, even as her YouTube channel struggled to get more than one video published a week. She's made friends with many of her virtual peers, the most notable of which being Kizuna Ai. Where she refers to virtual YouTubers who came before her as senpai, she calls Kizuna Ai, the original Virtual YouTuber, "Oyabun" (親分, meaning boss). Her peculiar voice is often compared to Hamtaro, earning her the nickname "Strangled Hamtaro" (首を絞めたハム太郎). Her design has similarities to Strong Zero, a Japanese alcoholic beverage (specifically, the Double Yuzu flavor). She's often drawn with sharp teeth, though this is purely artistic liscense.